Is your Honda SRS airbag light on after accident? Salvage car? Airbags deployed? Crash data or hard codes stored? If so, we can reset your Honda SRS airbag module back to factory condition - erasing all crash data and hard codes after accident! We reprogram your existing SRS airbag module back to factory condition. A Honda dealer will not be able to reset your SRS airbag module and neither will a scan tool. This service will reset your airbag light on and all codes! If your seat belts are locked, blown or not retracting, you will also need to have those repaired. We offer this service! An SRS airbag module is the computer responsible for all airbag-related components in your Honda. This includes crash sensors, airbags along with the steering wheel clockspring, seat belt retractors, seatbelt pretensioners and seat belt buckles. We offer 24 hour turnaround on all Honda SRS airbag modules! This service is offered to shops & individuals worldwide! Thousands of U.S. customers nationwide depend on getting their SRS airbag light reset by mailing in their SRS airbag modules to us for reprogramming, erasing all crash data and hard codes. We save our customers hundreds to thousands of dollars by having them re-use their exising SRS airbag modules. How do I remove my SRS airbag module? Disconnect your car's battery. This is a safety precaution. Located the module. It is usually located under the center console towards the back. You will need to remove the trim and the continue ti unbolting the unit and disconnecting the wires. Once removed you can reconnect the battery. Why is it important to reset the SRS airbag module? The SRS airbag module is a very important computer controlling all airbag-related componenets. If it is not functioning properly, you are putting yourself and others at risk! Besides, your car will not be safe to operate and will not pass inspections. Do I have to replace my airbags? Yes! 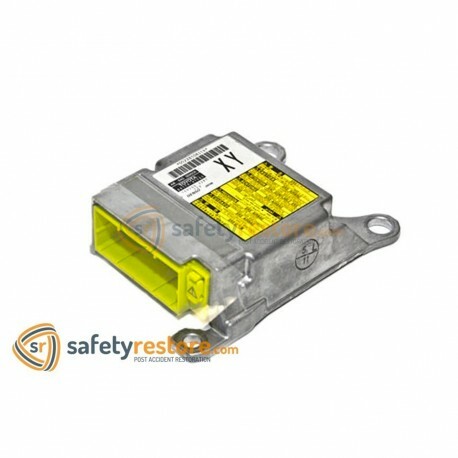 The airbags will need to be replaced prior to having your reset SRS airbag module installed. If your airbags are not replaced and you reset your SRS airbag module, your codes will come right back up! Airbags should always be replaced and installed when operating your vehicle for safety. Please do not put yourself or anyone else at risk by not replacing the airbags. We do not work with airbags, but highly recommend that you always purchase brand-new airbags from your dealer or an authorized reseller. What codes do you erase? We erase all crash data and hard codes in your Honda SRS airbag module. You can see or read the codes your system has generated using any OBD airbag scan tool such as the Autel AutoLink AL619 Scan Tool.